The Associated Press is on the wrong of a fair use argument again. 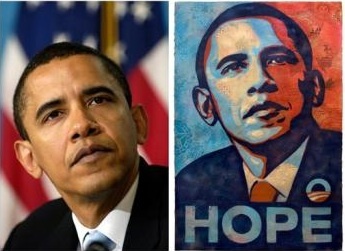 It is actually going after artist Shepard Fairey for his iconic Obama poster, which it recently discovered was based on an AP news photograph by Mannie Garcia. The poster is clearly based on that photograph (see comparison at left), but this is exactly the kind of use of copyrighted works that is meant to be protected. The poster is art. The image it is based on has been sufficiently transformed that even the AP did not know it owned the copyright to the underlying work until a few weeks ago. And Fairey says he hasn’t made any money from the poster, although others have. You can buy the image on posters, stickers, coffee mugs and T-Shirts, and copies of the poster signed by Fairey sell for thousands of dollars. Still, the AP is wants money from Fairey. I’d link to the AP story describing the dispute, except that we’ve banned the AP for exactly this kind of behavior in the past. The AP has a history of making copyright infringement claims that push the boundaries of the law. Last year, it went after Websites that copied its headlines, even if they had links back to AP stories. (The AP syndicates its headlines to news organizations, that’s how it makes money, but using headlines as links is also common practice on the Web). Fair use is under attack, and the AP is leading the charge. Artists like Fairey take copyrighted images and reinterpret them all the time. Many argue that is what art is. Fairey’s Obama poster certainly made a bigger impact on our culture than the original image, which he reportedly found by doing a Google image search. He is being represented by the Stanford Fair Use Project. I hope he tells them to go to hell, because if this isn’t fair use, I don’t know what is. 2) Where you either an employee, or a freelance photographer, as defined by their contract, for the AP when you took this image? I was a temporary hire, filling in for a staffer at the AP. It is my understanding that I was neither a freelancer nor a staffer, but rather a temporary hire. I have never been an AP staff employee, and no, I have never signed an AP contract. 3) So, you own the copyright to the image? The ownership of the copyright is in dispute, as per the AP. It is my understanding that since I was not a staffer, and was not a freelancer, and did not sign any contract, that I am the owner of the copyright, but I am in discussions with the AP over this issue.